﻿Glazed apertures in timber fire doors fulfill a number of requirements ranging from ensuring compliance with technical specifications to increasing the overall aesthetics of a doorset. The presence of incorrectly installed glazed apertures presents a weakness when it comes to the passage of fire. To ensure the correct specification, system selection and installation it’s recommended that glazing is factory installed or cut and glazed by a certified, licensed converter. The Pyroplex® 60 Minute Fire Glazing Seal System (PFG1HR) has been specifically designed and tested for use within timber fire doors and consists of two glazing seals and one aperture liner. The system has low visual sight lines and incorporated flexible flippers to accommodate tolerance variations in both glass and door cores, whilst maintaining sufficient glass compression. The system has been tested to the requirements of BS476: Part 22: 1987: clause(s) 6/7, and tested in conjunction with un-insulated and insulated glass types, including radiation glasses. The Pyroplex® 60 Minute Fire Glazing Seal System (PFG1HR) is accredited and approved under the CERTIFIRE Scheme TS25 – Fire Resistant Glass, Glazing Systems and Materials. 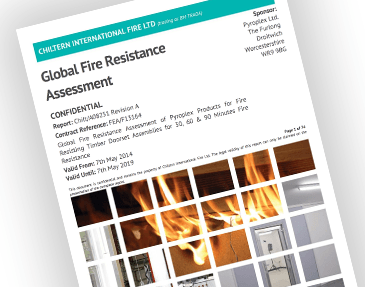 For further information please download a copy of CERTIFIRE Certificate CF5287. 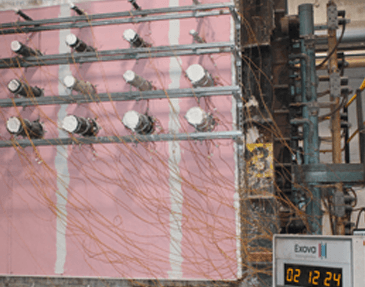 European Testing Standard EN1366-3:2009: Fire Resistance Tests for Service Installations.... Pyroplex EN Timber Door Testing Programme – Commenced!